It's happening. Ever since Fear the Walking Dead began fans have been waiting for there to be some kind of crossover with The Walking Dead, even when showrunners were insisting it wasn't in the cards. Then in October Robert Kirkman let the cat out of the bag that, yes, a crossover was in the works. And now we know which character will be making the jump from one zombie infested wasteland to another. Revealed on tonight's episode of Talking Dead, it will be Lennie James' character Morgan Jones who will appear in Fear the Walking Dead. And this won't be just a single episode cameo; he's expected to be a regular throughout the fourth season which is just beginning production. What's unclear is how the timelines match up. If the first two seasons of FTWD match up with TWD, then this would be a period of time that Morgan was away from Rick Grimes and off on his own. So this would help fill in the gaps of his backstory and explain the differences in his character upon returning. 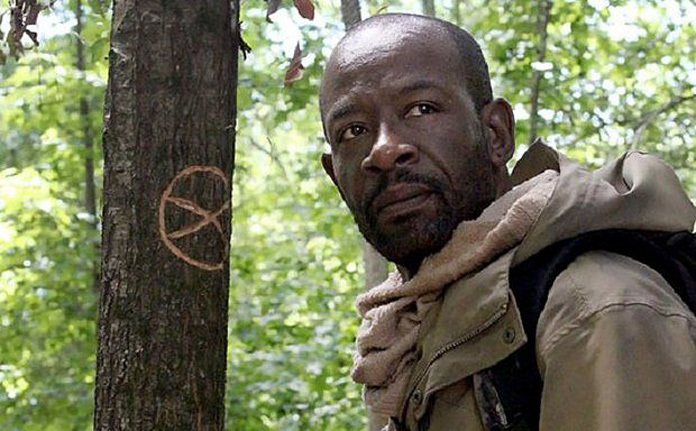 Showrunner and producer Scott M. Gimple did add that Morgan has "a lot of story left on The Walking Dead", but that could mean he's got a big part to play through the end of this eighth season. Morgan is one of TWD's most fascinating characters and I hope he isn't zombie food or a conquest for ol' Lucille.